Earlier today, ANBAD published another article on recent buzz band The 1975. Here’s the thing: I don’t like The 1975‘s music at all. I questioned how they got so famous so fast, and suggested that it could’ve been for a number of non-musical reasons. I would like to see people looking a bit further into the bands they are being fed. But I pulled the article because, in retrospect, it read like I was simply kicking a new band, which is not fair to them. I was trying to make a point about the state of the new music industry, and the role money plays in it now. Maybe I missed the point a bit. So, apologies are due to The 1975. Here, by the way, is today’s new band, who are a similarly guitar-shaped band, doing it another way – the older trudge-and-keep-trudging way. They’re called MUST. 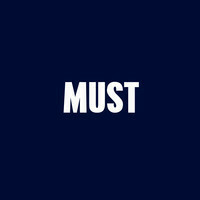 I’d hate for MUST to get lost under all the hassle of a pulled article, so please listen. They’re a good new band, releasing good songs, trying to find a route through the chaos. And so, here, we find out if we choose to listen to them or not. Because at this end of the market, it relies on us quite a bit. Posted on November 15, 2012 by Joe Sparrow. This entry was posted in Headline, Today's New Band. Bookmark the permalink. Nice to see MUST getting a spin-off post.